The intrapartum acid-base status, the status of the oxygen and other gases in the fetus and the umbilical cord after birth is important in establishing the link between events before and shortly after delivery. Analyzing cord blood gases (oxygen O2 and carbon dioxide CO2) from the umbilical artery is believed to be a good representation of the fetal acid-base status immediately before birth. Measurements of umbilical cord blood gases may be affected by several factors related to the method of sampling, storage, and assessment, and therefore there potentially a wide variation in accuracy. All human beings including the fetus inside the uterus before birth depend on two gases, oxygen, and carbon dioxide are being exchanged, oxygen enters the body and carbon dioxide exits the body. After birth, this exchange of gases happens in the lung, oxygen entering the body through inhaling and the lungs, and carbon dioxide leaving through exhaling and the lungs. But before birth, the fetus does not use its lungs the same way we use after birth. The fetus does not breathe in the same way humans do outside the womb (although “chest movement or “practice breathing” do happen inside the uterus before birth). Instead, the exchange of gases, “breathing” occurs in the placenta where oxygen is transported from the mother's blood vessels into the placenta and then from the placenta through the umbilical cord to the fetus and carbon dioxide is exchanged from the fetus to the mother. The placenta is an organ which is attached to the inside of the uterine wall and connects the fetus through the umbilical cord and allows for nutrient exchange, waste elimination and gas exchange via the mother’s blood supply. 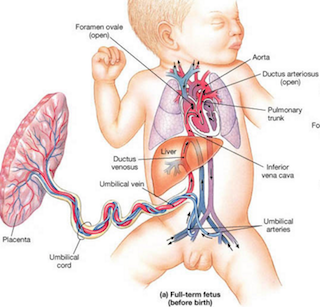 Oxygenated blood from the mother diffuses into capillaries in the placenta and the vein into the umbilical cord, specifically into the umbilical vein, which picks up this oxygenated blood from the capillaries, and carries it to the baby’s heart, which pumps the blood throughout the baby’s body. Once the fetus uses this blood, it is carried away from the heart and back to the placenta by both umbilical arteries into the placenta and then to the mother. In the intervillous space of the placenta, carbon dioxide diffuses from the fetus into the mother’s blood and the mother can eliminate it by exhalation through her lung. When she inhales, she picks up oxygen into her blood that is carried to the placenta and fetus. 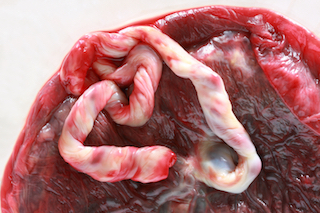 There are 3 blood vessels in the umbilical cord connecting the fetus to and from the placenta: two arteries and one vein. The umbilical vein transports blood from the placenta/mother to the fetus and the two umbilical cord arteries carry blood back to the placenta/mother. The purpose of cord blood gas analysis is to determine the acid-base status of the neonate at the moment of delivery. Since acid-base status is in flux during the perinatal period, the timing of isolating a sample for analysis is crucial. Immediately after birth, ideally before the baby’s first breath, an approximate 20-cm segment of the cord must be isolated between two sets of two clamps. Delay in clamping may result in significant change in acid-base parameters; the longer the delay, the greater is the change. The change is a progressive decrease in pH and base excess, and an increase in pCO2 and lactate. The blood in the umbilical vein reflects the placental condition. On the other hand, blood in the two umbilical arteries reflects the fetal status. There are maternal, uteroplacental, and fetal factors which can have an impact on umbilical cord blood gases. Medical conditions of the mother: These include hypertension, low blood pressure, diabetes, connective tissue conditions such as lupus and maternal lung problems. Length of labor: The length of labor may affect the umbilical cord blood values. At both extremes, too short labor and too long labor can impact umbilical cord blood gases. Delivery mode: The delivery mode, whether it's a cesarean or a vaginal birth can affect umbilical cord blood values. Cord anomalies: Most umbilical cord anomalies do not harm the baby. There are several known cord anomalies that can affect umbilical cord blood gas values including a knot in the cord, an umbilical cord twisted around the fetus' body parts (eg neck, limbs), a single umbilical artery, vasa previa, umbilical cord cysts. Abruptio placentae: A detachment of the placenta can affect the gas exchange between the placenta and the mother and prevent gases to be exchanged between mother and fetus. Instrument Deliveries: Studies have confirmed that instrumental deliveries such as with forceps or vacuum can affect blood gases. Shoulder Dystocia: Shoulder dystocia can affect blood gases. Unclear: Many times, abnormal blood gases are difficult or impossible to explain. In order to examine the fetus' status, umbilical artery blood needs to be examined as this is the blood coming from the baby (as opposed blood going to the baby through the umbilical veins). If umbilical artery blood is abnormal, then causes should be considered. There are wide ranges of umbilical cord gas values which can be considered normal. But whether a value is normal or not depends often on the circumstances of the birth and other information. *The “P” in PCO2 and PO2 stands for “partial pressure,” which is how these umbilical cord blood gases are measured.